Bahrain's main opposition movement, al-Wefaq, says its leader has been arrested after a day of questioning at the interior ministry. 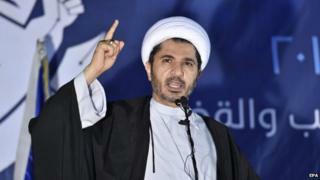 Sheikh Ali Salman was summoned for questioning about "violating certain aspects of law," the ministry said. His lawyer says he has been accused of "inciting hatred against the regime". Mr Salman joined thousands of Shia Muslims at a protest in the capital Manama on Friday, demanding the dismissal of government and parliament. Shia-dominated demonstrations against the Sunni monarchy, have been continuing for the past three years, with thousands arrested. The questioning of Mr Salman is likely to be connected with the legal status of al-Wefaq, which was banned after it announced it was boycotting last month's parliamentary elections, says BBC Middle East editor Sebastian Usher. The divisions between the Shia majority and the ruling Sunni elite remain as sharp and unresolved as ever, he adds. In a statement, al-Wefaq described Mr Salman's arrest as "a perilous and arbitrary adventure which will seriously complicate the political and security scene in Bahrain". Clashes between his supporters and security forces erupted outside his house near Manama after his arrest was announced. The interior ministry says his case is being referred to the public prosecutors. The 49-year-old secured a fourth term as head of the opposition group at its general congress on Friday. Al-Wefaq was founded in 2002, a year after Bahrain announced political reforms in which the country became a constitutional monarchy with an elected parliament and an independent judiciary.